Yes, five minutes is all it takes to make an out of this world sauce. The roasted peppers give it a bit of a smoky taste while the avocado adds a creaminess you wouldn’t believe. This is about to be your new favorite sauce! 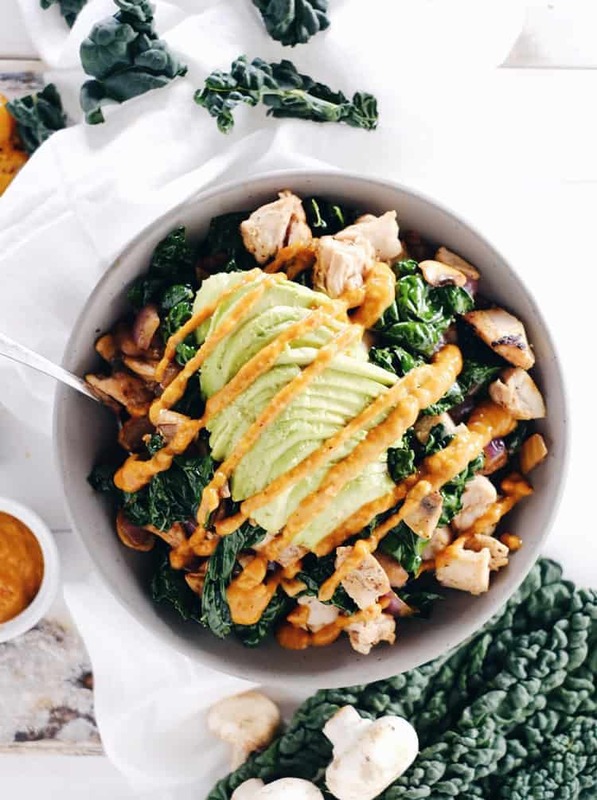 We love it on this Paleo chicken bowl! The best part about this bowl is how simple, yet hearty and nourishing it is. First of all, we love that it is made in one pan (excluding the sauce) because who doesn’t love less dishes. Let’s be real! In addition, in a single bowl we were able to pack so much goodness! We’ve got you covered with greens, protein, good fats, and more flavor than you can imagine. You’ll definitely put this one in your regular rotation. Another great feature of this recipe is that you can easily make more or less to fit your needs. Perhaps you just want dinner for one, or maybe you want to make extras to have for leftovers. It makes a great pack-and-go lunch! Go ahead, you can do it! 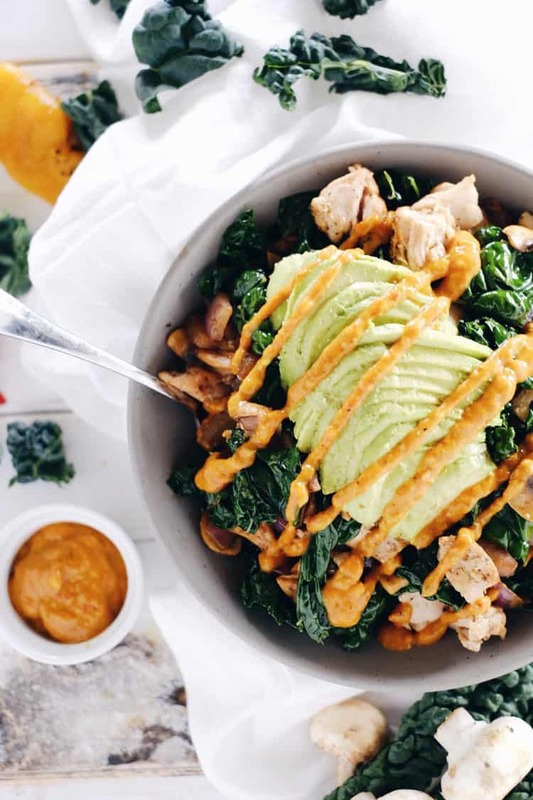 Make this Paleo chicken bowl and get all the goodness, plus a super delicious sauce you won’t be able to stop eating! Let us know how it goes, and leave a comment below. Then, take a photo and tag us on Instagram @realsimplegood, so we can check it out! We’d love to see! 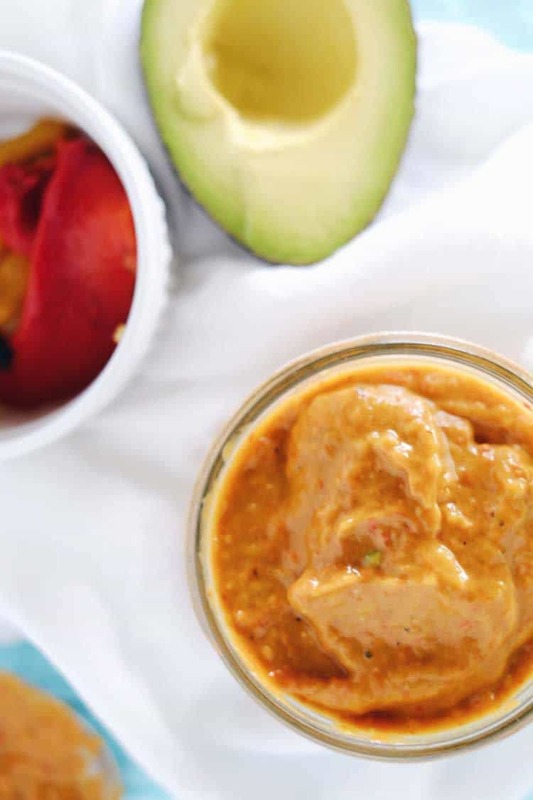 First make roasted pepper sauce by placing 1 avocado, the peppers, garlic cloves and a pinch of salt and pepper into a food processor. Blend until smooth and place in refrigerator to chill. Season chicken with salt and pepper on both sides. Heat a large skillet over medium heat and add avocado oil. Once hot, add chicken to cook, about 4-5 minutes per side. While the chicken is cooking, cut up onion, mushrooms, and greens. Once the chicken is cooked through, remove from skillet and place on a cooking board to rest. Add onion to skillet and cook for 3-4 minutes, stirring frequently until onions begin to soften. Add mushrooms and cook until they start to soften, another 2-3 minutes. Add greens and cook until they begin to wilt, about 1-2 minutes. Remove from heat. Slice chicken into bite-sized pieces and mix with veggies. 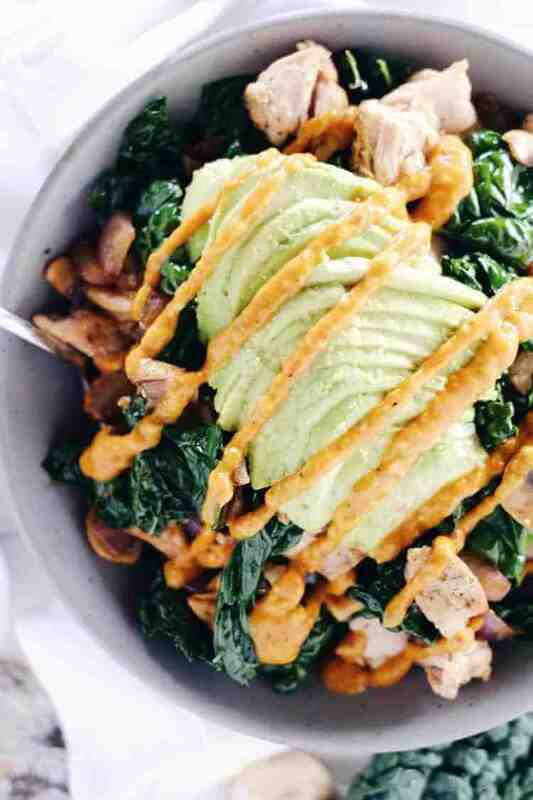 Serve in bowls and top each bowl with 1/2 avocado and a generous amount of roasted pepper sauce. This recipe is amazing!! I used leftover turkey from Thanksgiving but kept everything else the same. The red pepper sauce is incredibly flavorful. Thanks for sharing these wonderful recipes! Yay! So glad you loved it Kathy! Such a good use of leftover turkey, too! Good thinking! 😉 Thanks for taking the time to try our recipes and leave a comment! Hope you’ll be back soon! I love this recipe! Thank you so much for sharing it. Hey there! 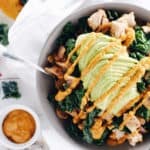 I wonder if you might find that you can cook paleo friendly meals for everyone and just add some grains/starch for your hubby and kid as needed. We have some meal plan clients who do that and find that it makes cooking for their family easier and more manageable. Many people who try out our meal plans say that they were expecting eating paleo to be less flavorful, but feel like they actually eat more flavorfully than before! You’re welcome to email us at support(at)realsimplegood(dot)com to chat more. In addition, here’s a link to our meal plans for more info on those! How long can the roasted red pepper sauce be stored in the refrigerator? I’m concerned about the avocado making the sauce turn brown or unappealing. It actually will last 4-5 days in the fridge (ours rarely makes it that long before we use it all) We hope you give it a try! Might already have the ingredients for this in the house! Super into red peppers right now…. yum!!!! Perfect, we hope you love it!